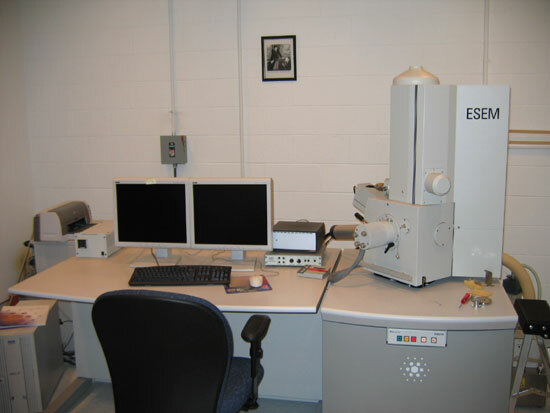 The XL-30 Environmental Scanning Electron Microscope (ESEM) is a state of the art high resolution research instrument. It has a field emission electron gun (FEG) and can be operated in three vacuum modes, e.g., conventional high vacuum, low vacuum and true environmental mode. These capabilities, together with wide range of detector, make it possible to imaging almost any sample with only exceptions of volatile liquids and gases. The XL-30 ESEM is equipped various detectors, such as, secondary electron, gaseous secondary electron, wide-field secondary electron detectors, back scattered electron Detectors (GBSD and BSD) for both high vacuum and gaseous environment. It is also attached by an EDS system (PGT) and an EBSD system (HKL Technology).